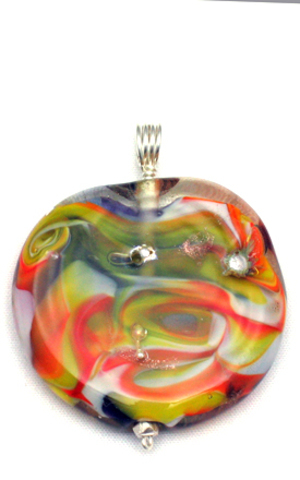 Because clear glass is layered between the other colors of glass, one can see deeply into the bead. Unfortunately, this depth does not show in the photographs. The bead is designed to be worn as a pendant on the black satin cord which comes with it or it can be strung on a favorite chain. The sterling silver wire bale has an opening that is approximately 3/16" in diameter ... large enough for most omega and similar chains. The bead is flat and nearly perfectly round with an approximate diameter of 1-3/8". Note: Also see Birth of the Cosmos: The First Alchemy on the Necklace and Earring Set Page (item #NE-105).